I created these little beauties yesterday morning for my son for breakfast, he’s a bit of a pancake connoisseur and fortunately they passed the test. Oats has one of the highest levels of phytic acid of all the grains, phytic acid prevents the absorption of nutrients and causes inflammation in the body, just soaking the oats doesn’t really do much to remove the phytic acid as oats doesn’t produce enough phytase, the enzyme responsible for this job. Enter rye! Rye produces an abundance of phytase so soaked rye is combined with the whole oat groats and does the job of removing the phytic acid beautifully. 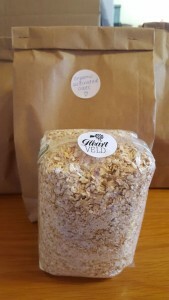 These activated oat groats are then dried and rolled and are ready to be turned into a rich creamy porridge or to be used in granola, or these pancakes. 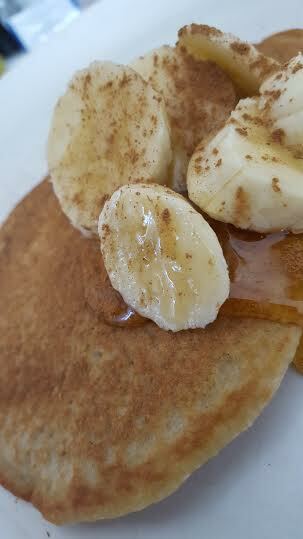 Urban Delicious honey, organic cinnamon and a sliced banana to serve. Blend oats, eggs, yoghurt, bicarb and salt until smooth. Heat a pan, add 1/8 cupfuls of batter, cook until bubbles form on the surface of the pancake then flip to toast the other side for 20 seconds, continue until all the batter is finished. Top with honey, cinnamon and sliced banana.